As regular readers may recall, Raymond went and bought himself a used truck several months ago, for dump runs and other helpful exercises at the Manse. What he hadn’t counted on was the long and winding road to getting it plated and insured in Ontario. Apparently in Quebec you can buy a used vehicle and get a license plate for it and nobody says boo, which is odd if, like me, you are of Ontario origins and know about the whole safety-certificate system – that is, that vehicle ownership can’t be transferred until the vehicle passes a safety check. I did warn Raymond that this was what lay in store for him if he wanted to get Ontario plates (which he did; unlike a certain scofflaw [though much-loved] former boss of mine, who drove his car around with B.C. plates for years after moving to Quebec, Raymond likes to have everything just so, so if the truck was going to be based in Ontario, it had to have Ontario plates). But neither of us expected what a long-drawn-out process it would be, what with various repairs needed to the truck at various repair shops, and then an emissions test, and much paperwork all round – all difficult to arrange when we are only here at the Manse sporadically. 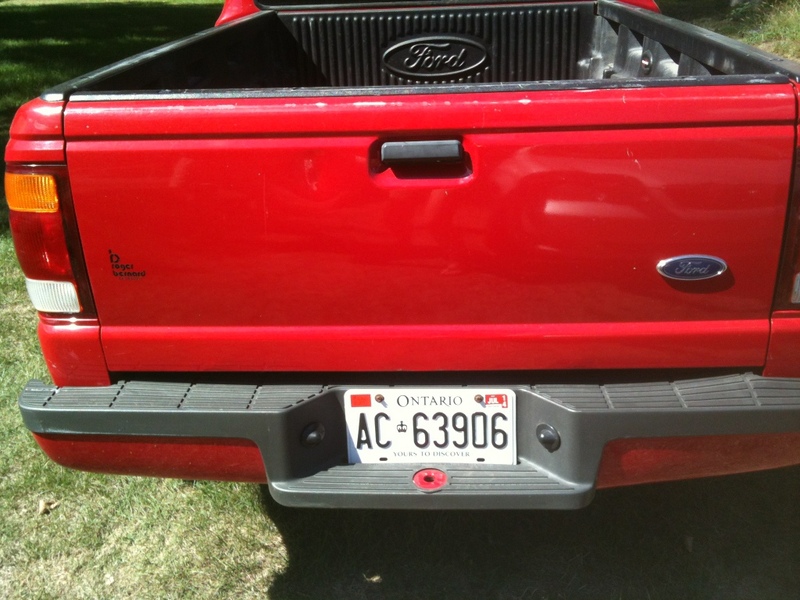 But this morning, with an emissions test done in Belleville, Raymond was finally able to get his Ontario plates. And here is the photographic evidence. This entry was posted in Uncategorized by Katherine Sedgwick. Bookmark the permalink. And boy is he happy about it!